Over the years there have been many Philadelphia Flyers that have gotten in trouble with the NHL, but none more than me. Over the course of my career I was suspended 9 different times for a variety of things. Once was even for punching a referee. Do you know who I am? Since Mark Recchi scored 91 points in the 1999-2000 season only 3 Philadelphia Flyers have reached the 80 point plateau in a single season. Can you name the 3 and put them in the order from the highest to lowest? A Philadelphia Flyer has reached the 100 point plateau 8 times over the years. One guy did it 3 times, I did it twice and 3 other guys did it once. Also, I scored more points in a single season than any other Flyer. Do you know who I am and how many points I scored? As a bonus, can you name the other 4 guys? Philly Pressbox would like to thank our sponsor, shop.com/thefurmans. Please help us support them back by clicking on the following link, www.shop.com/thefurmans and gain access to nearly 3000 stores for all of your on line shopping, comparison pricing and cash back on your purchases. Signing up is free with no obligation to buy. Type in nearly anything in the search bar and you’ll likely find it there. I was traded to the Flyers for a future Hall of Famer and I was traded away by the Flyers in the biggest trade in Flyers history that likely involved another future Hall of Famer? Do you know who I am? As a bonus, do you know who the first Hall of Famer was that the Flyers traded to get me and second do you know who the future Hall of Famer was that I was packaged up with? On February 13, 1973 against the New York Islanders I became the first Flyer in team history to score 4 goals in one game in our 8-2 victory. We were actually behind 2-0 after the 1st period and scored 8 unanswered goals. I scored 3 of my goals in the 2nd period and one in the 3rd. Two were on the power play and two were even strength. Do you know who I am? On April 26, 1997 against the Pittsburgh Penguins I accomplished a feat that set two NHL Playoff records that still stand, Most Shorthanded Goals in One Playoff Game and Most Shorthanded Goals in One Playoff Period. Do you know who I am and how many “shorties” I scored?? 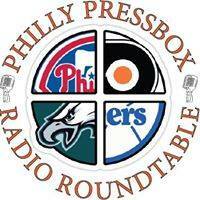 Philly Pressbox reached another milestone yesterday when our site https://phillypressbox.wordpress.com passed the 15,000 view mark on our writings. We would like to thank everyone that has taken the time to read our material. We enjoy talking all Philly and Penn State sports as well as our very popular inspirational Word of the Day. We’ve recently added the daily Philly sports and PSU Football trivia that people seem to really like. You can go to the “ARCHIVES” section on the site and see all of our writings in the files. Feel free to click “FOLLOW” and receive our writings directly to your email. Next goal is to reach 1500 Facebook friends. We’re at 998. It’s tough to add when FB keeps you suspended for trying to add. Special thanks to our Shop.com sponsors. www.shop.com/bobsullivan and www.shop.com/thefurmans !!!!! !